When I first got this book in the mail, I had never heard of it before. This is especially shocking since I am a worshiper of the goddess that is Kiersten White. Needless to say that when I saw the lovely cover and Kiersten's name, I got pretty excited. I was a little wary of the whole mixed media thing (told through both written narrative and illustrative narrative), but when I started reading it, I was like, "Hey, this is kind of cool." As I got further into the book, I grew to like it even more. And by the end? I was in love, finding that In the Shadows had gradually, but surely, secured a special place on my heart's bookshelf. It is always so great when a book can surprise you with it's awesomeness. In the Shadows is told from the perspective of five different characters: Cora, Millie, Thomas, Charles, and Arthur. Cora, the elder daughter, used to be fun and outgoing but, after an unfortunate incident and the death of her father, grew cautious and reserved. I loved that we actually got to see this scene happen, as it occurs before the rest of the story. I had a great deal of sympathy for Cora, though I wished I could have seen a little more of what she was like before, possibly through a couple of brief flashbacks via Millie. Millie is the polar opposite of Cora, possessing a sort of wildness and curiosity about her with a penchant for story telling. Thomas, the elder brother, was similar to Cora in that he wasn't much of a talker or adventurer, but I got this sense that he had a wild side back home, and I hated that I didn't get to see any of that in him at the boarding house; I wanted to know more about his past. Charles, his younger brother, is gravely ill but full of humor, charisma, and a live-life-while-you-can, no worries attitude that I adored. He loves a good problem to solve and Millie proves the perfect challenge for him. Then we have the broody and mysterious Arthur, who was, quite frankly, probably my least favorite of the group, but I came to appreciate him towards the end. Finally, we have our little group of villains. There is Mary, the crazy woman (witch?) that lives in the scary house on the hill. I actually really liked what was done with her character and found her to be surprisingly dynamic. Then there was Alden, who very thoroughly and effectively played the role of evil villain. And Constance, who is also, you know, evil. However, she had this deceptively sweet charm about her that I just loved. All of this being said, if there was one thing I had to pick as a weakness for the book, it would be the characters. They all had such great, distinct personalities, but they weren't given a lot of time to fully develop their potential. This bothered me some, because I wanted more, but I found not nearly as much as it would have bothered me in other books. 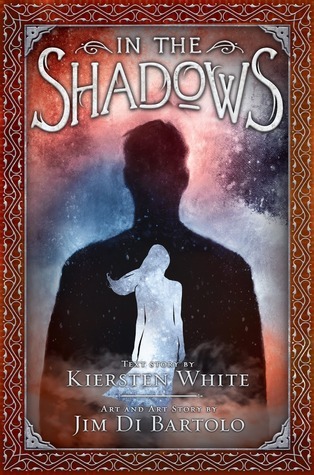 In the Shadows is told in two alternating story lines. One follows the lives of the aforementioned characters through the written narrative, taking place at a boarding house in Maine. Then there is the illustrated story line which follows a mystery man on a dangerous journey into the future and across the world as he searches for the society. I had a couple of characters that I was considering for the role of this mystery man, and in the end, the one I was most sure of was correct. Seriously though, this book had it all: a dash of romance, action, intrigue, and some mild horror. Seeing the two story lines play out in juxtaposition was thrilling and revealed information in some of the most fascinating ways that kept me guessing throughout. White and Bartolo made a very wise decision in how to go about writing the two stories in terms of plot timelines. All of this is why I wasn't too upset by the shortness of character development. This book was all about telling a story, and I could imagine sitting at the foot of a rocking chair while listening to some wise elder telling it to me. I could see and hear this story.This would make an awesome frikin movie if it weren't for the fact that it would probably get butchered. Kiersten White's writing was just magical, but no shocker there. The style of this story was quite different than the Paranormalcy books, and her writing style adapted quite nicely to fit In the Shadows. It was lyrical, descriptive, and full of haunting and mesmerizing imagery. I enjoyed the third person (on the fence between omniscient and limited) perspectives, as it really added to the fact that the focus of this novel is to tell/show a story. However, I felt that this, combined with the fact that we had five perspectives, contributed to a lesser development of the characters. The written sections were often brief, and I sometimes had a hard time knowing who the focus was on. Honestly, I think this novel could have used a little more of the actual written sections to balance out the illustrated portions. This book could have easily been around 450 pages. Moreover, what was there did suffice to tell the story that needed to be told. Jim Di Bartolo's illustrations were lovely and very versatile, though never in a way that felt inconsistent or disjointed. The dramatic lines, use of colors and shading did an excellent job of getting across the more eerie aspects of this story. At the same time, there would be panels that had me going, "Wow, this is really exquisite." Bartolo's illustrations worked so cohesively with the written narrative when it came to reflecting both In the Shadow's dark and beautiful sides. They also did a very efficient job of fulfilling their responsibility for their half of the story. They weren't pictures to simply be glanced over and moved past; they demanded to be looked at more closely for full appreciation and understanding of the story being told. And I loved this about them; they had good looks and a brain. As this book was drawing near its end, I could see a pretty clear connection between the two stories being told, but I also still had a ton of questions. More questions than I thought could be answered in what remained. But I was wrong, and the stories ended up pulling together to create the perfect conclusion. I'll admit, there were a couple of small questions that lingered about, but I was able to answer them for the most part by going back through the illustrated panels. In the Shadows wasn't a book that I finished and just put down; I took my time going back through, looking for things I might not have noticed the first time around, and it was great. Everything made so much sense going back with enlightened eyes. This book works excellently as a standalone novel (and let's face it, we could use more standalone books), but if another book came out following more closely the story that was told via the illustrations, I'd buy it. Cause I was left craving more. Characters: Great, distinctly varied cast of characters, but could have been more developed. Writing: Magical. But what else should I expect from Kiersten White? Would have liked to have seen a greater ratio of writing sections in contrast to the illustrated ones. Plot: Exciting, palpable, and brilliantly plotted. Illustrations: Beautiful, dark, and creepy. Ending: Perhaps a bit rushed, but wrapped things up wonderfully. Enjoyment/Likability: I didn't fall head over heels in love right off the bat; instead, it took its time winning me over. And what girl doesn't like to be properly wooed on occasion? Recommendable: OMG, yes. Read it! Perfect for a dreary, rainy evening. Overall: This book had a couple of small flaws but, overall, was an exceptionally pleasant surprise, and I'm so glad that Scholastic sent it to me. Because of the format, this may not be everyone's cup of tea, but I highly recommend giving it a try, even if it is out of your comfort zone. In the Shadows is a masterpiece of a story, a work of art that only two truly great minds could have executed so seamlessly. This book has reaffirmed my love for Kiersten White's writing, and it has also given me a new illustrator to keep an eye out for. Mad props, you two. Hello all! My name is Briana, I'm 20, and I live in the beautiful state of Georgia. I love reading and photography. The content of The Book Pixie IS NOT public domain. Any unauthorized copying, editing, redistribution or display of any content without my expressed permission, is and will always be strictly prohibited. © All written content is copyright of Briana McNair, The Book Pixie.